The remodel included a kitchen, dining room, master bedroom and bath. The Wilton’s were intrigued by the all inclusive process of design, architect and contractor all in one. It fit with their lifestyle of working parents to have one point-of-contact for the entire project. Having a design expert was helpful to bring their vision to life. It also provided what they were looking for when they couldn’t creatively picture the design themselves. 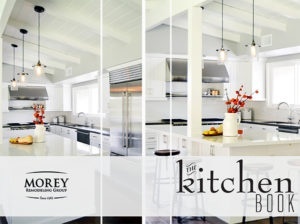 One of the challenges that Morey Remodeling had to overcome was to create an open floor plan for the kitchen since Kate was 8 months pregnant at the time. She could no longer squeeze behind the tight area to get to the fridge. Morey Remodeling overcame this challenge by extending the kitchen into the laundry room to create one big space. A closet was built to keep the washer and dryer out of sight.